The Bowling Club’s season runs at The Centre @Halton from autumn to the following spring. We would welcome any local residents to attend our sessions which take place on Tuesday afternoons from 1.30pm until 3.30pm from September to March. The last session this term is on 27th March and the Club will restart on the last Tuesday in September. We have four mats and can provide bowls. Half way through the afternoon, we enjoy tea or coffee and either biscuits or other delicacies. Payment is £2 per session which includes refreshments. The Club also subsidises a meal out – in autumn, at Christmas and in the spring. 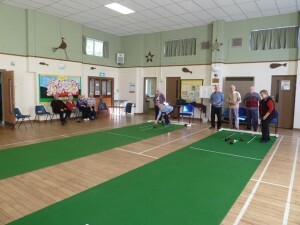 Anyone who can help to put away the bowling mats each week at around 3.45pm will be very welcome.